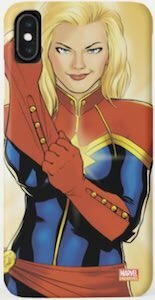 Now there is an amazing Captain Marvel Key Chain. With the female superhero being known by the whole planet you can now show that you like this Marvel superhero by having this Marvel key chain that just shows it off while keeping your keys together. 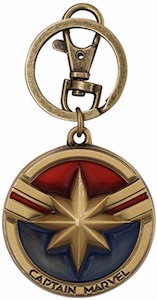 The key chain is made from pewter and has a key ring for your keys and a clip for adding functionality and then there is a round pendant on it that has the famous star of Captain Marvel on it and her colors red and blue and then on the lower edge it has her name Captain Marvel printed on it.